The hybrid kits are growing fast and are now a month old. The weights this week are: 490g, 590g, 483g, 567g, 529g, 531g, 515g and 454g. That’s a total increase from last week of 2130g which means they more than doubled in weight. 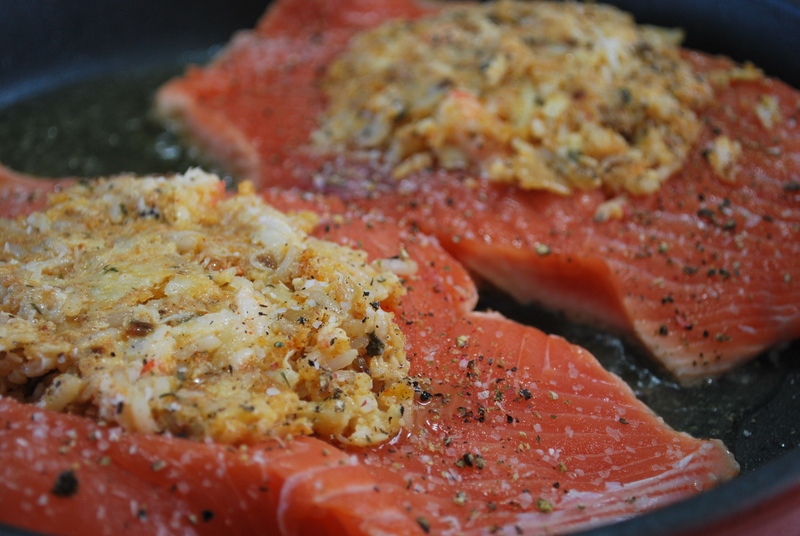 This is based on the real components used in Costco stuffed salmon, except the kind of gross Stove Top Stuffing mix has been replaced with natural ingredients. I love this dish and I know my mom loves it too! It’s actually very simple to put together and produces far better results than the store bought version. It’s easy to get the three main seafood ingredients if you have a boyfriend with a little fishing boat and you live on Vancouver Island. I’m so lucky! Rinse rice and cook or use leftover rice. Saute onion in butter on medium-high heat until translucent, about 5 minutes. Add garlic and cook for one more minute. Add breadcrumbs and spices and toss well, saute for one more minute. 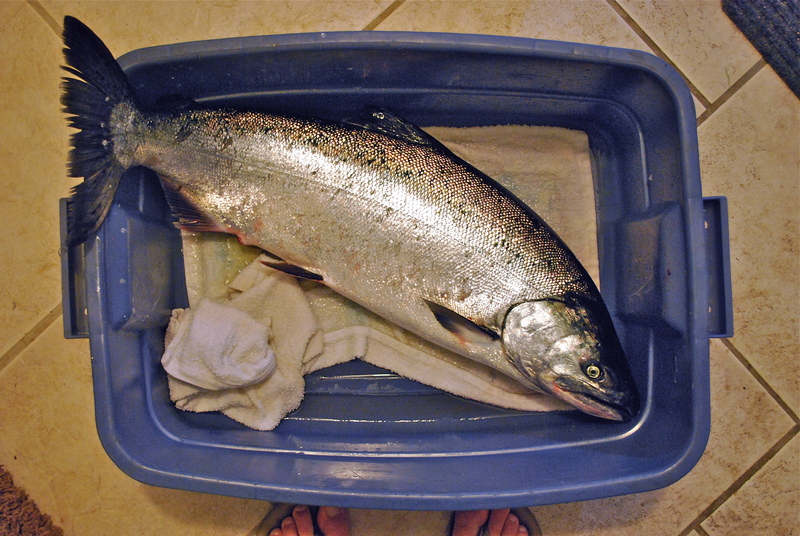 Transfer to bowl and add the rest of the ingredients except the olive oil and the salmon. Mix well. Slice a slit lengthwise down the middle of each salmon filet and divide your portions of stuffing into balls, pressing them firmly into the centers of each steak. Heat olive oil in a skillet on medium-high, season your salmon with salt and pepper and cook for about 5-7 minutes on each side depending on thickness and desired doneness. Allow to rest off heat for 3 minutes before serving. Garnish with lemon wedges. Serves six but uncooked extras will keep in the fridge for up to three days, so dinner for two for three days in a row, maybe? Today was Scorch’s inauguration as a breeding buck. He’s grown a lot since I bought him, and he’s a laid-back Californian boy. He was bred to Esther the Creme d’Argent and Samphire, my other Californian. He was excellent with the ladies and I could tell they liked him as they lifted right away. He’s big but he’s gentle. 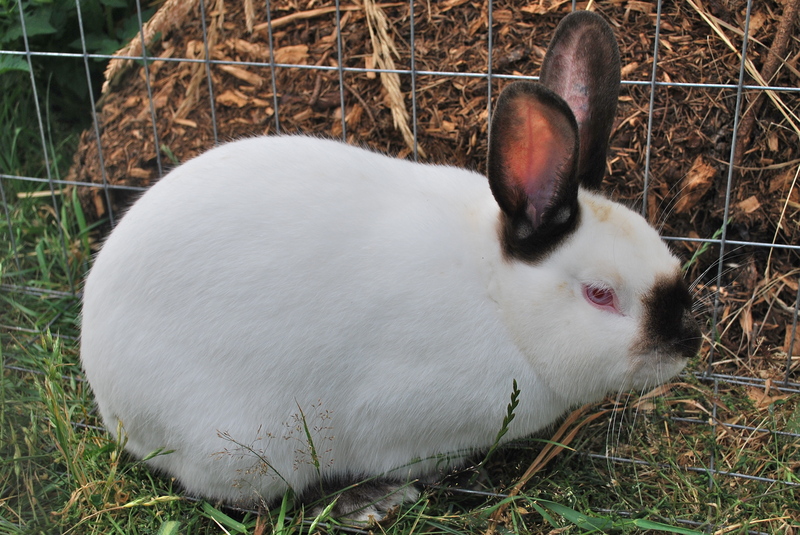 Looking forward to my first litter of hybrid Creme/Californian kits, and hopefully a nice litter of purebred Californians. 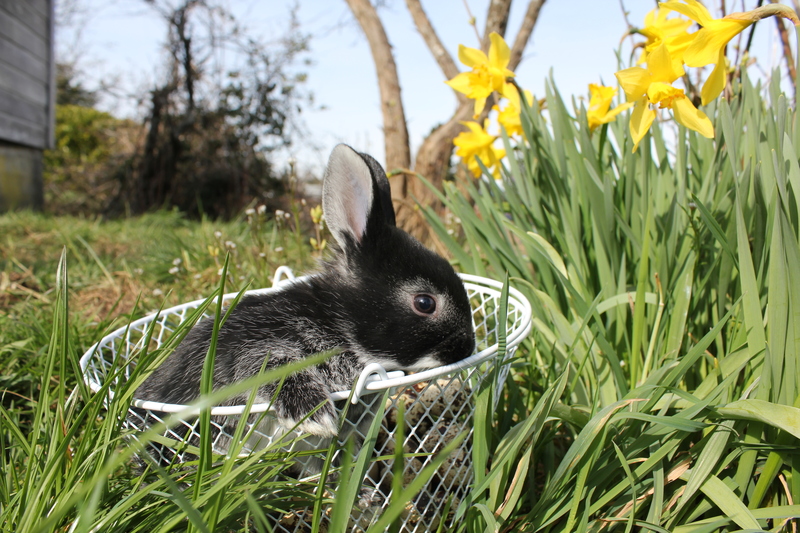 It will be Samphire’s first litter, so anything or nothing could happen. The ducklings have been with us for for almost two weeks now and are settling in very well. Today, much of the coop floor is being excavated by the hard-working boyfriend and we’re going to lay at least a foot of woodchips down. This should help cut down on the mud. Bonus is that all the manure-rich material that was dug out went straight into my tomato and tomatillo beds. 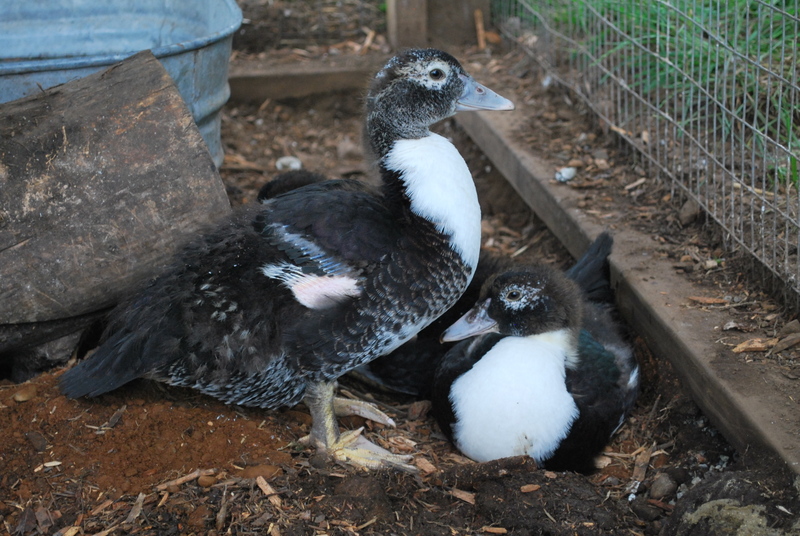 If all goes as planned, we’ll have more Muscovy ducklings hatching out the beginning of July. It’s going to be very ducky around here! 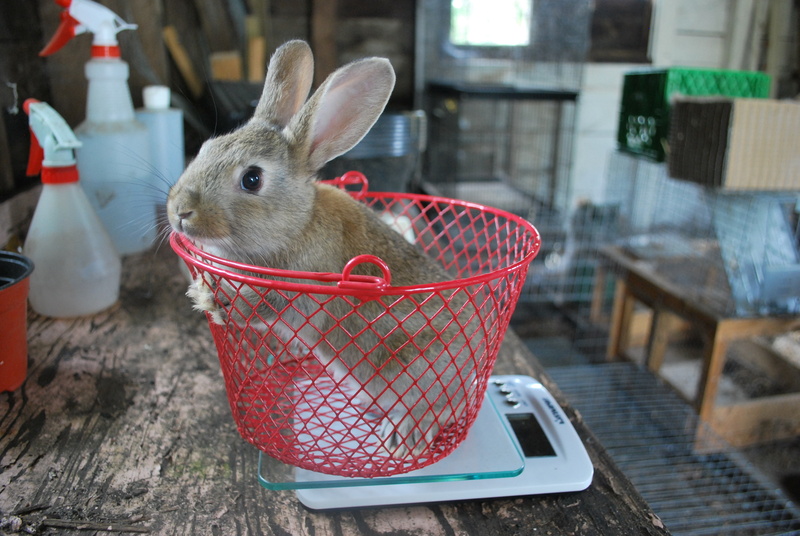 Although I’ve been breeding rabbits for awhile now, I’ve never done weekly weigh-ins. 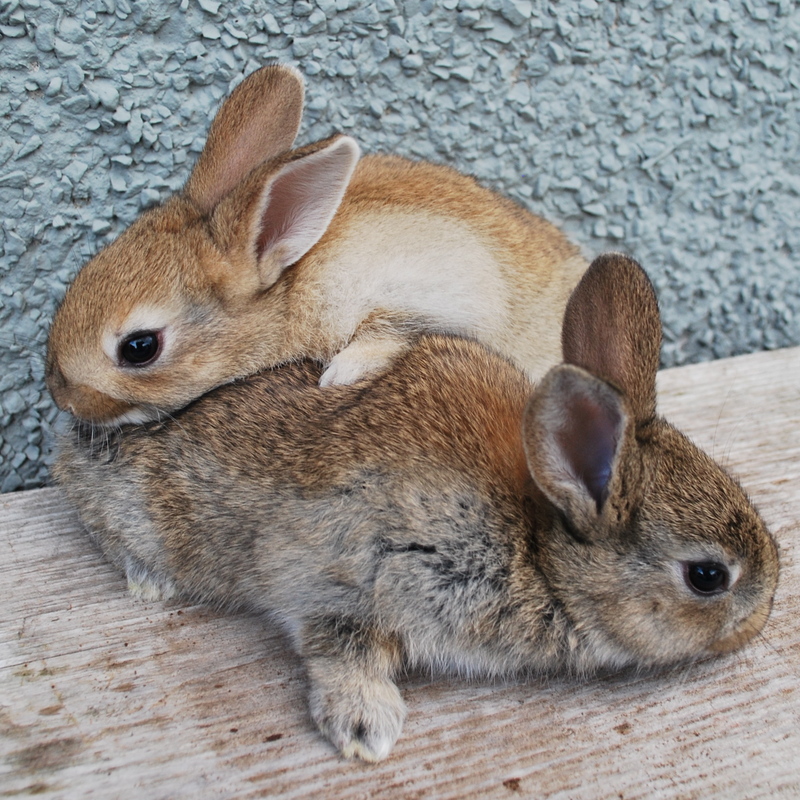 Since I may keep one of the hybrid does, I’m curious how they compare to other rabbits, so I’m going to try it with this litter. Esther’s hybrid kits are a day shy of three weeks old today. The recorded weights are 240g, 289g, 227g, 240g, 212g, 300g, 253g and 268g. You can see the variation in coat color very well now. 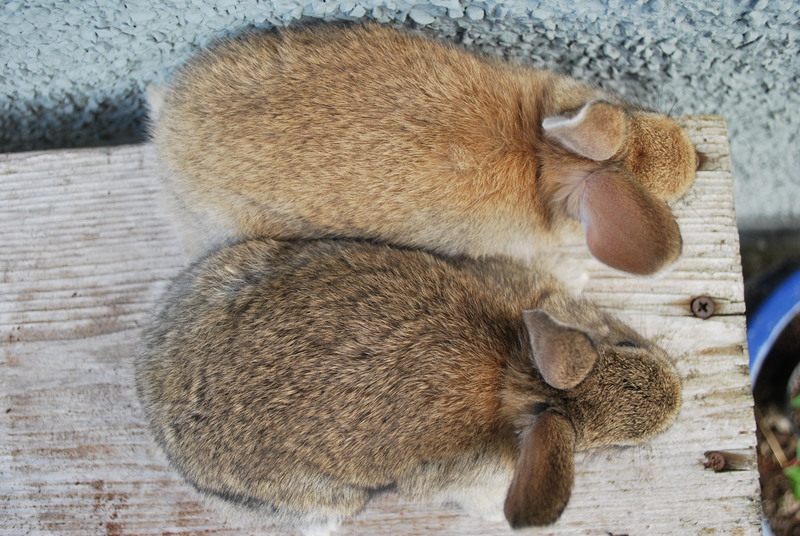 The kits from this litter are less consistently colored as her previous ones, and I quite like the lighter, reddish ones. I sexed all the older kits today and so now they’re up for sale. Rosalind the Silver Marten decided she didn’t like me this time and threw seven bucks, two does and one I’m pretty sure is a buck, but not positive. One doe has already been sold. The other doe is the runt, who survived despite everything. One buck is reserved and the other six are for sale for $20 each. Tuna likes me more and gave me four does and four bucks. I don’t need any Standard Rex bucks so they are all up for sale. I have one Self Black, one Blue Otter and two Black Otters for $20 each. I’ll be holding on to the does for another couple of weeks or so until I make my final decision on who will be staying on as a brood doe to replace Io.